Do you think you are a Descendant but don't know which one? Would you like to Connect with other Descendants? The Ship Hector Descendant Project began in 2015, in an effort to assist the genealogy community, tourists and interested people determine if they are related to one of the passengers on the Ship Hector. Many visitors to Pictou have Pictou County roots. Starting with the passenger list and information previously compiled, the research began! The goal of the project is to research the families of the passengers and their descendants and connect to present day descendants. The year 2023 will mark the 250th anniversary of the arrival of the Ship Hector in Pictou, Nova Scotia so it will be invaluable to have names and contact information of descendants to invite to a celebration! The Ship Hector Descendant Project is a "work in progress”. In addition to the ongoing genealogy research involved, a quarterly newsletter is distributed to subscribers. If you have information to share, please get in touch. A Facebook page has enabled connections to be made, and it is hoped that this website will "cast a wider net" to find and connect with more descendants. If you know you are a descendant of a Ship Hector passenger, or think you might have a connection, we’d love to hear from you. Thanks for stopping by! Copyright Ⓒ Canada Post Corporation, 1973. Reproduced with permission. In 1989 the Town of Pictou created the Pictou Waterfront Development Corporation to oversee an extensive revitalization of the Pictou waterfront. A key component of this project was the construction of a Ship Hector replica. The keel of the Ship Hector replica was started in August 1990 and after ten years of construction, the replica Hector was launched with great celebration in September 2000. In 2010, the replica and building was purchased from the Town of Pictou by the Ship Hector Society, a volunteer organization that oversees the operation of the Hector Heritage Quay, an interpretive centre alongside the replica. The Hector Heritage Quay provides information and a unique guest experience that tells the story of the voyage of the Ship Hector in 1773. People from around he world visit the Quay each year to learn the story and see the replica. The highlight for most visitors is seeing the “below deck” living quarters for the 189 passengers on the 10 week voyage from Scotland. 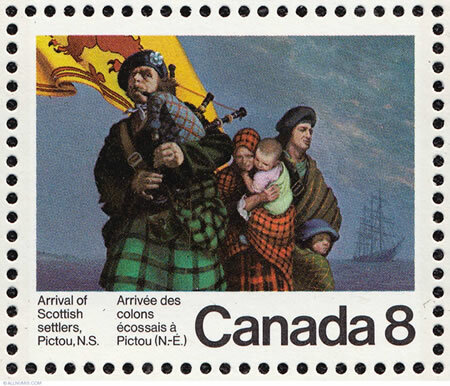 Some of the visitors to Pictou and the Quay are descendants of Ship Hector passengers. Many more have Scottish roots and believe they might be but have not confirmed a direct connection. The Ship Hector Descendant Project hopes to help people solve their family puzzle, confirm their family’s ancestry and maybe connect with long lost cousins. Thank you for the information about my ancestors! So, my Fraser ancestor did come on the Hector. Wow, so glad to know that. Thank you for your interest and support with regards to our family genealogy. We look forward to sharing information and trying to complete this picture. I think the work you are doing is both interesting and important. If we don’t collect this information now it could be lost forever. This research you are doing sounds very exciting! Perhaps this will lead to some new information for all of us.